Researchers from the Swiss Federal Institute of Technology developed an implantable capsule that causes the natural immune system to prevent the accumulation of the beta-amyloid proteins that lead to Alzheimer’s disease. Thus far, the device has proven successful in laboratory mice. The following research may give hope to seniors and their Alzheimer’s caregivers in Rhode Island. The capsule targets the amyloid proteins that clump together and form the plaques that damage neurons and interfere with normal communication between the brain cells. Scientists believed that tagging the proteins would alert the immune system to see the compounds as harmful invaders that require destruction. The proteins would then be prohibited from accumulating and developing the destructive plaques. Accomplishing the task would require seniors to receive regular vaccine injections, which poses the possibility of individuals experiencing side effects. The method of vaccination proposed by the group of scientists simplifies this process. An implanted capsule would provide continual treatment without the risk of these side effects. The capsule or macroencapsulation device is designed to be biocompatible, which means the device resists rejection. The device measures a mere one inch in length and five-hundredths of an inch in thickness. A polypropylene frame has two permeable membranes that contain hydrogel, which promotes cell growth. The cells contained within the capsule are designed to create antibodies that recognize and tag the amyloid beta proteins. The interior cells are protected by the membranes from the body’s own immune system. Yet the cells receive nutrients from surrounding cells outside of the capsule. Once the encapsulated cells tag the proteins, the immune system destroys the compounds. The capsules were tested and evaluated in mice for over 39 weeks. The scientists were pleased with the results as the antibody treatment successfully prevented the formation of amyloid beta protein plaques. However, the research remains in the early phases of development. Researchers have yet to test the treatment on human study participants. Provided the research proves effective, it may soon be possible to prevent Alzheimer’s disease before Rhode Island dementia care is even required. Alzheimer’s is a challenging disease that families shouldn’t have to face alone. Fortunately, Home Care Assistance of Rhode Island can help. We provide comprehensive Alzheimer’s home care Rhode Island seniors need to exercise cognitive function, sharpen mental acuity, and delay dementia symptoms. Additionally, we help seniors with everyday activities including personal care and mobility assistance. 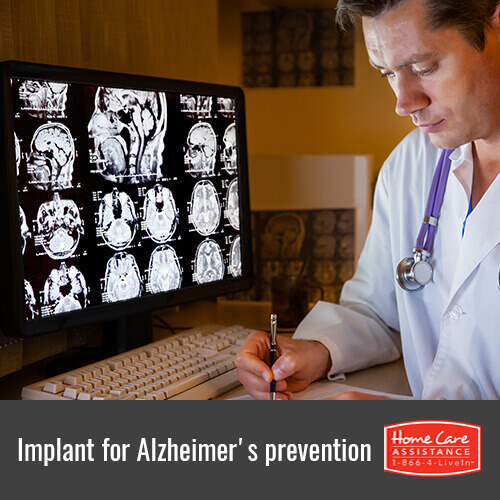 Contact a compassionate Care Manager at (401) 284-0979 today to schedule a free in-home consultation.